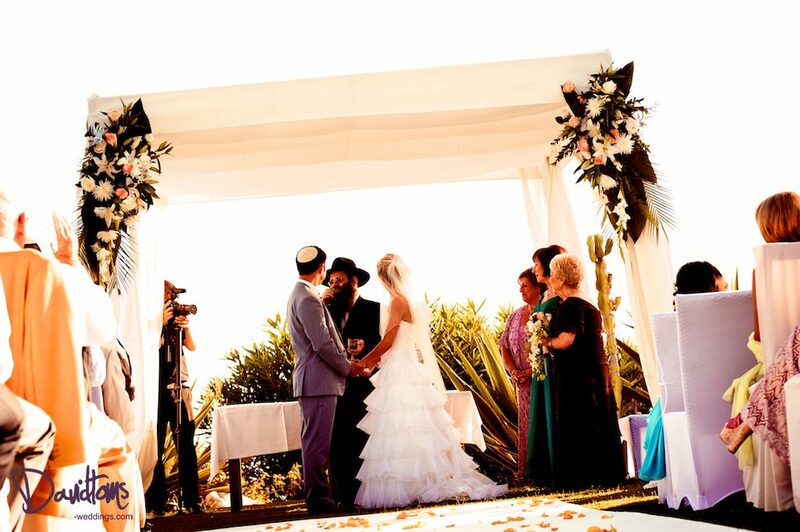 Sunshine Weddings Spain have organised over 100 Jewish weddings over the past 11 years, and we have had the pleasure of providing Jewish families with the experience of getting married in Spain. Jewish weddings have a strong cultural feel, focusing on family, friends and socialising, with the guest list adding up to, in some cases, well over 150 people, and with the choice of wedding venues from rustic fincas to sophisticated hotels and beach clubs, bridal couples can find their dream wedding venue in Spain. Food is a huge part of the Jewish culture and family, so catering is an important part of the wedding party. With an array of fabulous wedding venues all located near to, or next to, the Mediterranean Sea, fish is on offer on most menus. For those who need to ensure the food is Kosher, Malaga, one of our most popular destinations for Jewish weddings, has a great kosher wedding caterer fulfilling all expectations. Fun and partying is a must when organising a Jewish wedding in Spain and they certainly share the same culture as the Spanish. Israeli dancing traditionally takes place before dinner and themed music is played where men and women dance separately in groups and then are joined together by the bride and groom raised high on chairs. The excitement and energy adds to the atmosphere and fun of being outside celebrating in the warm night air under the stars. Getting married in Spain really is an easy choice for many Jewish families, they are still able to perform their traditional Jewish wedding ceremony, either flying out the Rabbi from their synagogue, or requesting the help of Sunshine Weddings Spain; we have close links with one of the local Rabbi’s in Malaga who has performed a number of touching ceremonies in all of our Spanish destinations. Even though the wedding takes place in Spain, all the traditions can still be re-enacted including the “bedecking ceremony”, which is held before the actual “chuppa ceremony”, a tradition relating to an ancient tale where Jacob was tricked into marrying the wrong sister. In the “bedecking ceremony” the groom checks the bride is the correct person and places the veil over her face in the presence of his family and the Rabbi. With the bridal party gathered under the chuppah the family can experience the “breaking of the glass”, a symbol of good luck which is the finale of the wedding ceremony, and seals the marriage. What better way for any Jewish family to experience getting married; in Spain, under the chuppa and in the mediterranean climate.